It's been a while since I've added any paintings to my blog, but it doesn't mean I haven't been working! Well, that's another story . . . Here's the latest little painting I've finished. It's a Landseer Newfoundland puppy, named Charlie. He's a beauty, I think. 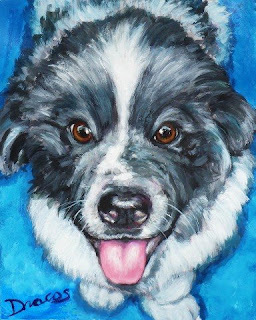 I created this painting after someone sent me photos of her dog, not a commission, but just because I make the offer that if someone sends me photo(s), I may or may not paint their dog, depending on what I think of the photos. These photos I loved, so I painted the painting, let the owner know I had painted it, and sold it to her at my regular 8x10 price of $150, plus shipping (commissioned 8x10's start at $250 for a full body like this one). If you want to take the same chance, that I might paint your dog (or cat), and make it available for sale (to you first, only if you want it, though) email me (dottie@wildwildthings.com) and I'll tell you what to do.